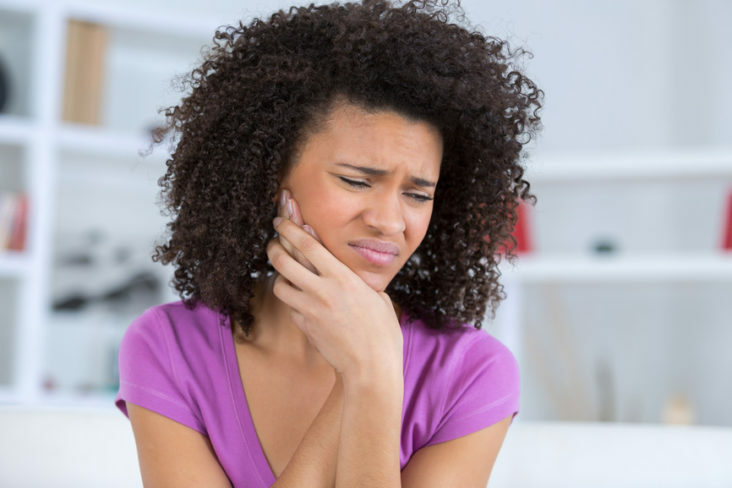 If you suffer from painful jaw muscles and headaches, the problem might be that you grind your teeth. This is a problem that many Canadians experience. For a lot of people, stress is one of the biggest causes of teeth grinding. Other underlying issues can be sleep apnea, which is a condition where one stops breathing at night. For other people, it can simply be a habit. Dentists often recommend splits and teeth guards to help patients protect their teeth and to alleviate jaw pain and headaches which results from teeth grinding. We also see hypertrophy of the muscle, where the muscles around the jaw get bigger as a result of the grinding. If you wake up with jaw pain, headaches or a feeling of tightness, then you should book a consultation with a dentist. Some people use injectables such as Botox, but this is a symptomatic treatment of the muscles only. 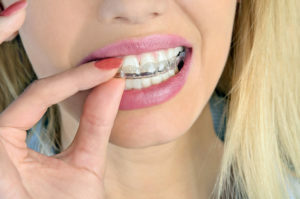 If you are one of the many people who clench their teeth, then you can avoid a long list of symptoms (such as wearing of the teeth, fractures of the teeth, headaches, neck pain, back pain and jaw pains) by getting a tooth guard (night guard) that has been fitted by an experienced dentist. Most over-the-counter mouth guards are clunky and bulky, making them uncomfortable to wear at night. Dr. Ralph Bastian, a dentist in Peterborough, uses high-quality tooth guards that have a hard surface for durability and a wedge design that relieves symptoms of teeth grinding and teeth clenching. Book an appointment with Dr. Ralph Bastian today. The joints in the jaw are a delicate mechanism that can easily be injured or inflamed due to chronic stress. It can make chewing and talking uncomfortable. Looking after our teeth is important, so is taking care of your jaw also a top priority. The three most common causes of jaw discomfort are sports injuries, car accidents, and stress. Temporomandibular joint disorder(TMD) occurs when there is damage in the temporomandibular joint (TMJ). The TMJ is a set of paired joints on each side of the face in front of the ear canals. These joints are very complex and have a disc that can be damaged or dislocated. TMD involves jaw pain that is often accompanied by a muscle spasm in one or more of the large muscles on either side of the jaw. Following stress or an injury, the body attempts to prevent further damage by causing muscle spasms that restrict the movement of the jaw . The ideal solution to this problem is to use an athletic sports guard. 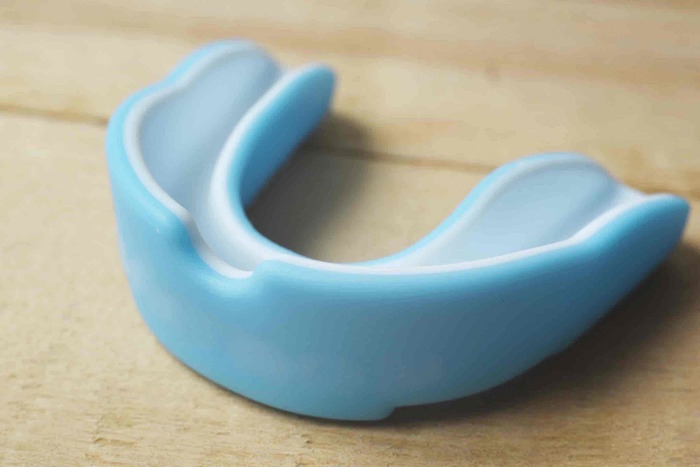 Made from soft materials to absorb the force of a sudden impact; a sports guard will protect the jaw and teeth against trauma on the sports field. The guard functions by distributing the force of a frontal impact or absorbing the sudden upward force of the mandible. If the guard were not in place, an impact on the chin could fracture numerous teeth. A common side effect of a car accident is the accompanying jaw pain. Pain in the jaw or facial area, trouble opening and closing the mouth, or having a jaw that seems to click or get stuck can happen after an accident. You do not have to directly hit your jaw during the accident for this to happen. A car exposes you to many types of movement not normally experienced. These sudden jerks, twists, and falls that happen when you are involved in a car accident, can damage your joints. In today’s modern cars many TMJ injuries may be caused by the sudden deployment of air bags during a crash. And the temporomandibular joint is susceptible. The injury is similar to that of a whiplash. A few simple jaw exercises and regular physiotherapy can make the joints in the jaw much more flexible after sustaining an injury and reduce muscle adhesions. Ibuprofen and acetaminophen are commonly prescribed, the compresses help to flush out the lactic acid build up from the muscles. Stress is the most common cause of temporomandibular joint pain. When we are stressed, we tend to grind our teeth (bruxism) and clench our jaws. This is often subconscious . This is usually seen during episodes of acute stress. Conversely, chewing gum to release such stress can aggravate the condition. After doing this for a long time, the temporomandibular joints will become inflamed and swollen. In many cases the teeth may not even make contact on one side. This frozen jaw and pain will need to be treated. Thankfully, for most people, a night guard is the ideal solution, in conjunction with physiotherapy. Built to withstand repeated grinding and wear-and-tear, the hard shell of a night guard is used to distribute the biting force, reduce stress on the join and preserve opposing tooth structure. If you are suffering from jaw pain, it probably is due to a sports injury, accident or stress. Dr. Ralph Bastian, at Bastian Dentistry, has over thirty-four years of dental experience. He is well-equipped to see to all your joint pain and to decide on the best course of action. For more information, contact us today. Our teeth are precious and can last for a lifetime if we take care of them properly. This often means seeking care when we need it. The dentist’s chair can be daunting but too often serious problems occur because we leave a trip to the dentist too late. At Bastian Dentistry- we will do all we can to save your teeth and hopefully prevent oral surgery. Gum disease or periodontitis is an inflammation of the gums that can progress to bone loss. It starts off as gingivitis, and can become periodontitis and can lead to advanced periodontitis if not treated. This is when the infection spreads to the bone – leaving you in danger of losing your teeth and possibly needing periodontal surgery or extractions. A study titled Prevalence of Periodontitis in Adults in the United States: 2009 and 2010 estimates that 47.2 percent of American adults have mild, moderate or severe periodontitis. That is almost half the population. A periodontal cleaning can address this problem before it is too late. If you notice you have swollen, tender, bleeding gums, persistent bad breath, receding gums, loose teeth and pus surrounding teeth then contact Bastian Dentistry before the infection spreads. Dr Ralph Bastian will assess the situation and devise appropriate treatment accordingly- and you may find you get to keep your gorgeous smile intact. In most cases of tooth infection we can prevent extracting the tooth. A root canal is used to save a badly damaged or infected tooth. It involves removing the diseased pulp, cleaning and disinfecting the canal and then sealing it. A cracked tooth, a deep cavity, repeated dental treatment or trauma can cause damage to the nerve requiring a root canal or extraction. Paying attention to the symptoms and accessing quality dental care is the best way to avoid tooth extraction. Bastian Dentistry offers emergency dental care so do not delay a call to Dr Ralph. Most emergencies can be seen on the same day. Sometimes there is no other answer other than to remove and perhaps, replace the tooth. Bastian Dentistry offers tooth extraction and tooth replacement options. We have excellent facilities to take care of you. We also assist with the problem of arch crowding. This is when you have large teeth and small arches. Working with your orthodontist, we can help make room. When wisdom teeth, the third molars at the very back of the mouth, begin to erupt there can be pain and swelling. 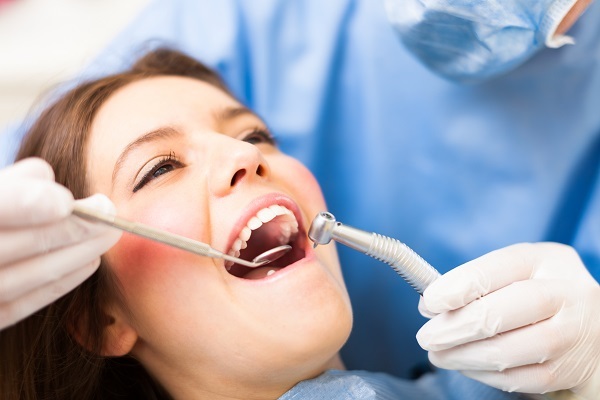 At Bastian Dentistry we are happy to help with most dental surgeries you may require. Dr Ralph Bastian has been an active Dentist in Peterborough for over 34 years and will be please to take care of your teeth. Contact us for more information today. Athletic mouth guards are designed to distribute the force of an impact of a puck, elbow or stick during contact sports. Damage can be devastating without a sports guard, especially in contact sports such as hockey, football, basketball and even soccer. Protect your precious pearly whites while playing these sports and avoid a trip to an emergency dentist by wearing a sports mouth guard. What Are Athletic Mouth Guards? An athletic mouth guard or a sports mouth guard is made from a thermoplastic material that absorbs the impact and distributes the force of the hit over many teeth instead of the border of a single one in the upper jaw. The athletic mouth guard protects the maxilla (upper jaw) as most impacts take place there. If the mandibula is struck from below, the sports mouth guard absorbs the impact as the teeth impact the surface, reducing the trauma to the biting surfaces and the TMJ. Helmets are a good way to protect your teeth as they offer a layer of protection. Helmets are designed separately for each contact sport; however, helmets are not always guaranteed to help you. Playing certain sports puts you at risk of chipping or even losing a tooth. So, you should always wear a professionally fitted mouth guard so as to be properly prepared for emergencies. Not wearing a mouth guard can result in cracked, chipped or even teeth that are knocked out. 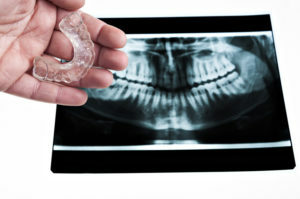 An athletic mouth guard can help to reduce the injury and the severe pain as well as a lifetime of expensive treatment. If a tooth is lost, for a young person an implant is the logical solution. This typical cost in excess of a few thousand dollars. This is an expense that could be avoided easily. Although sports guards can be purchased from a drugstore at a cheap price, these are not always effective and can still result in an injury. The most effective mouth guards are customized to fit into your mouth and it is also the most comfortable option. The dentist takes an impression of your teeth witch is used to create a guard that is an exact fit. These are custom-made and durable. You are fully protected, as the guard will not be knocked out of your mouth if it is hit hard during a game. In younger children, with a developing dentition, a new sports guard should be created every fall to ensure a proper fit. Once they reach the teen years, this may not longer be required, as the jaw changes very little. Dr. Ralph Bastian can design a customized, high-quality athletic mouth guard for contact sports that will help you to avoid an injury. For more information on sports mouth guards or an emergency dentist, contact us for a dentist in Peterborough today. As most parents know, you won’t be able to teach your kids good habits if you don’t show that you are following the good habits yourself. Just as you have to eat your vegetables, stick to traffic rules and never litter, if you want your kids to brush their teeth in the morning and evening, then you need to show them that the adults in the house are doing this as well. 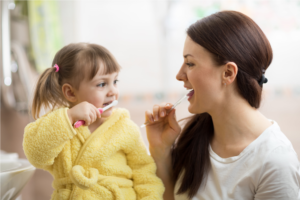 A good idea is to brush your teeth together as a family so that it forms part of your morning and evening routine. This will also enable you to supervise the children’s teeth brushing technique and monitor the amount of time they spend brushing their teeth. The memory may be too hazy, but if you think really hard then you may recall your parents putting toothpaste on your toothbrush for you. If you have small children, particularly those under two years old, then it is critical that parents place the toothpaste on children’s’ toothbrushes for them. The amount of toothpaste shouldn’t be larger than the size of a small pea. 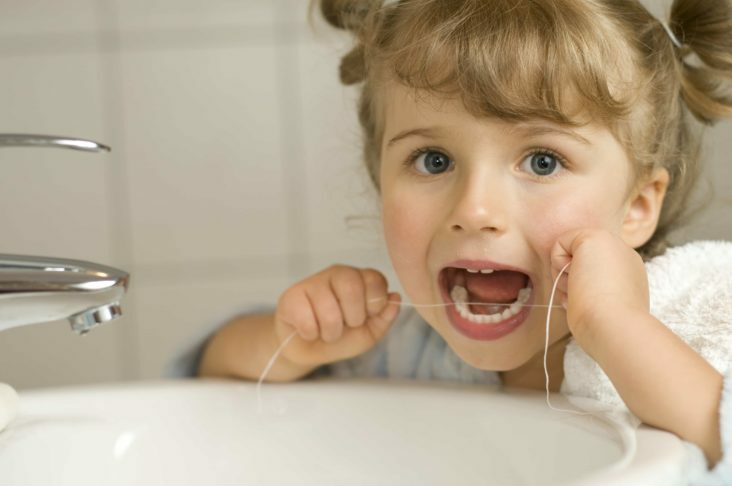 If your child is still very small and they are not able to spit out the toothpaste, rather buy a non-fluoridated paste. If this isn’t an option, opt for no toothpaste instead. In this case, the child will brush their teeth with a toothbrush and water. It is important for parents to take their children to a dentist at a young age if there is a suspected problem. Even if your child is only 1 years old, dental issues shouldn’t be left unchecked as it can lead to discomfort and bigger problems later on. A quick check-up that turns out to be a ride in a dentist’s chair can even be considered a success for parents of a busy youngster. Parents could also consider turning the visit to the dentist where younger children watch their older siblings having a dental check up and cleaning. This technique is called modelling and it is very helpful in a dental office and within family units. Bastian Dentistry helps people who love to smile. Whether you need advice about your child’s oral health or would like to book a dental appointment with a family dentist in Peterborough, we can help you. Dr. Ralph focuses on family dentistry and cosmetic dentistry. Contact him today. One of the reasons why people experience discomfort from their dentures is due to the tissue under the denture shrinking. This tissue can shrink as a result of ageing or even changes in weight, which can loosen the denture. The solution to this is realigning the denture or replacing it completely. Another common reason for denture discomfort is dry mouth (xerstomia). This condition leads to many oral problems. It is typically caused by the medications that most patients require. The side effect from many of these drugs is a reduced saliva flow. This in turn causes denture discomfort, irritation and redness. Dentists can recommend medications, rinses or creams to alleviate this condition. Patients often present with cracking in the corner of the mouth and fire red tissues under their dentures. This typically indicates and oral yeast infection. A prescription and/or rinse are required to treat this. Left unchecked, the infection can cause an oral burning sensation and leave unsightly lesions at the corner of the mouth. Another situation that can lead to denture discomfort is poorly made dentures. Over time, dentures deteriorate and become thinner. This leads to breakages in the acrylic and possible dislodging of the denture teeth. Regular visits to the dentist will ensure that your dentist picks up on small problems before they escalate to large, unsightly and uncomfortable situations. Don’t put up with Denture Discomfort! Not all denture discomfort is reason for serious concern. It is common to experience some pain after receiving new dentures. It is typical to have two or three adjustments after a new prosthesis is delivered. It is important that the bite is balanced in every direction of the chewing cycle. 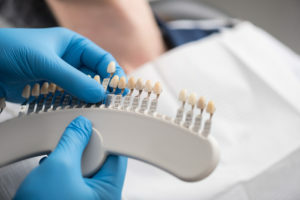 If left untreated, a serious bite imbalance will lead to premature bone loss and denture discomfort. If you are unsure whether you should be worried about your denture discomfort, then book an appointment with an experienced dentist in Peterborough to have your denture repaired or treated. Contact Dr. Ralph Bastian for more information today. We use our mouths in all walks of life. Eating, talking and even to certain extent breathing. With our oral health being so important to our physical well-being, it is imperative that we have regular check-ups. We should also ensure that corrective action is taken when things start to go wrong. In some cases, we may require the services of an oral surgeon. Whether you are in need of a routine wisdom tooth extraction, or whether you require some more complex dental surgery, all your needs can be met under one roof at Bastian Dentistry. After the surgery, you will receive a care handout. It will contain cleaning and healing instructions. Please follow it closely as these instructions can speed up your recovery tenfold and it will prevent infection setting in. Do not do strenuous activities after the surgery. A hike in blood pressure or bump or scrape could re-open any incisions that have been made. For at least 24 hours after surgery, take care to eat solely soft meals. Smoothies and baby food taste great and are fantastic nutritional substitutes. It may seem productive to aggressively rinse your mouth with mouthwash or salt water, but this could actually be detrimental rather than beneficial. You should refrain from doing it for at least the first 24 hours after the surgery. Gentle tooth brushing of your mouth is possible, but you have to be extremely careful to not run the bristles over the tooth extraction site. Bastian Dentistry is a comprehensive dentistry practice. Our services include general, cosmetic and restorative dentistry. We provide a wide range of Oral Surgery procedures, from routine wisdom tooth extraction to more complex dental surgery. Bastian Dentistry has a friendly and welcoming environment to make you feel at home. 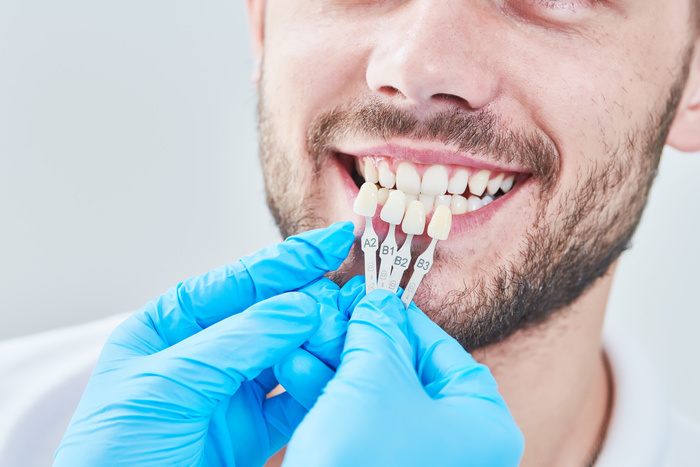 Find out more about our services today and get that perfect smile.